The Biggest, Scariest Haunted House in Michigan ! DarkSyde Acres Haunted House in Michigan. Are you looking for a one-of-a-kind ghostly experience this Halloween season? 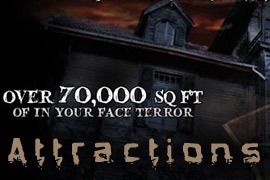 Tired of spending time and money on multiple attractions to get your fill of fear? Look no further! Hidden away in rural southern Michigan is your one-stop shop for a scary good time! Darksyde Acres has proudly scared residents of Michigan, Ohio, Indiana, and Illinois for 10 years, along with guests from 39 other states and 21 different countries. 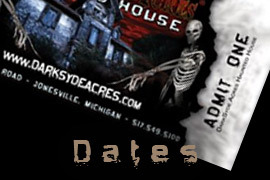 Located just off of US 12 at 11375 Rowe Rd in Jonesville, MI, Darksyde Acres offers 5 EXTREME haunted houses with no animatronic characters and unique, hand-built sets that cater to all ages and fears of all kinds. With over 70,000 square feet of attraction, Darksyde Acres is one of the largest haunts in the tri-state area. It’s guaranteed that you will get more scares for your dollar at every turn. Do you dare to join us for our 11th year of fear and face the creatures that lurk in the darkness? Fun fact: Darksyde Acres was voted the #1 Haunted Attraction in Michigan in 2012 and 2013. This haunt boasts Hollywood quality horror FX from award winning Michigan based company, BodyBag Entertainment. Just $22 gets you an all access pass to one scary location, 5 haunted houses, and a haunted maze. Guaranteed the best bang for your buck this Halloween season! Thanks to our wide variety of haunted houses, there is sure to be one to please everyone in your group this Halloween. What will be your favorite? * The newly redesigned Rusthole will place you right in the middle of a terrifying sci-fi adventure as you flee a wide array of unnatural creatures. This haunt will shock your body and mind alike. * The Catacombs is sure to please fans of everything undead. Forget everything you think you know about storybook zombies. Will you make it out alive, or will you be the newest addition to the DSA zombie crew? * The Dark Abyss will send you on a terrifyingly unique nautical adventure through the haunted pirate ship of Captain Carcass and Bloody Mary, along with their ragtag crew of bloodthirsty pirates. Will you go down with the ship or live to tell the tale? * A ticket to bright, zany 3D Klownetowne will throw you into a carnival of nightmares headfirst as you come face to face with maniacal klowns whose only wish is to tickle your funny bone. * Labyrinth will be the scariest chainsaw maze you ever encounter. Your adrenaline will rush and you’ll have to stop to catch your breath…just don’t let yourself be caught by one of the evil masked chainsaw wielders on a rampage. For more information please be sure to explore our website and learn more about the most talked about Halloween attraction in Michigan, Indiana, and Ohio. If you’ve been through Darksyde Acres and are looking for more spooky fun, see our Special Events section and our Halloween Haunted House Finder for a list of other area haunted attractions. Check out our blog for inside information, updates on the attractions, upcoming events, and other haunt related topics. Come join us for our 11th year of fear and see why we have consistently been voted the biggest, scariest Halloween attraction in the state!